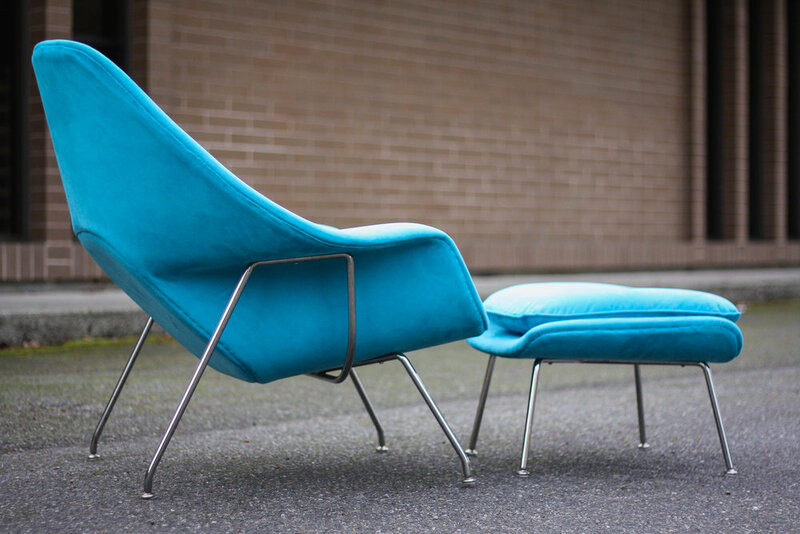 Fresh from the upholsters is this amazing Womb Chair designed by Eero Saarinen for Knoll. The chair and ottoman have been given all new foam and are covered in nine yards of Maharam Waterborne Ultrasuede in Aqua. The fabric alone runs $152/yard. The chair is incredibly comfortable. The fabric very soft and pleasent to the touch. What's more, the ultrasuede has no loops that could be pulled by a kitty or pup, repels spills, and is significantly more stain resistant over a wool blend fabric most commonly found on womb chairs. This chair is the perfect candidate for hours of lounging so why wouldn't you want to put a soft, kid/pet proof, fabric on it. The upholstery was completely hand sewn as was originally intended when the chair was designed. (On current production Womb chairs by Knoll they have put unsightly welting around the perimeter of the frame to save costs and conceal the machined seam).